Power out, air-tight D chassis connector with flat tab terminals. 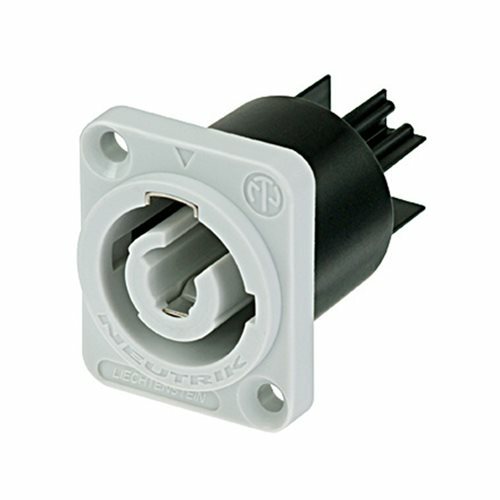 A Locking 3 conductor equipment AC connector, contacts for line, neutral and pre-mating ground contact. With a fast and easy locking system and high current capacity (20 A rated) the NAC3MPB is extremely robust and reliable. Meets all prevailing safety standards, UL recognized, VDE certified and SEV approved. Very good cable handling and protection. Note: The PowerCON is a connector without breaking capacity, i.e. the PowerCON should not be connected or disconnected under load or live!